Time capsule buried in 2018 to be opened in 2068. Wednesday, June 20, 2018 will be remembered as a historic day at Jacksonville International Airport (JAX). 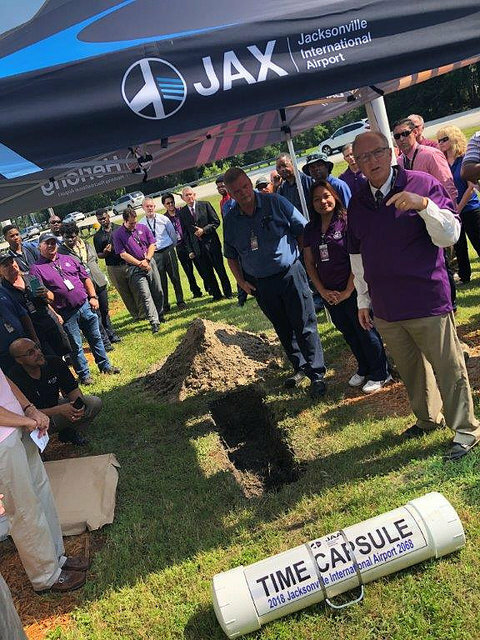 Airport tenants joined Jacksonville Aviation Authority (JAA) employees to bury a time capsule. 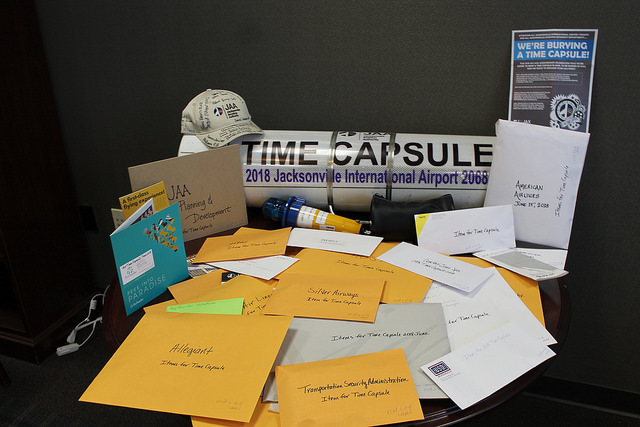 It contained contributions from many of the airlines serving JAX, each JAA department as well as other items from tenant and community partners. The time capsule was buried in celebration of the airport’s opening 50 years ago in 1968. It’s not to be opened until 2068. 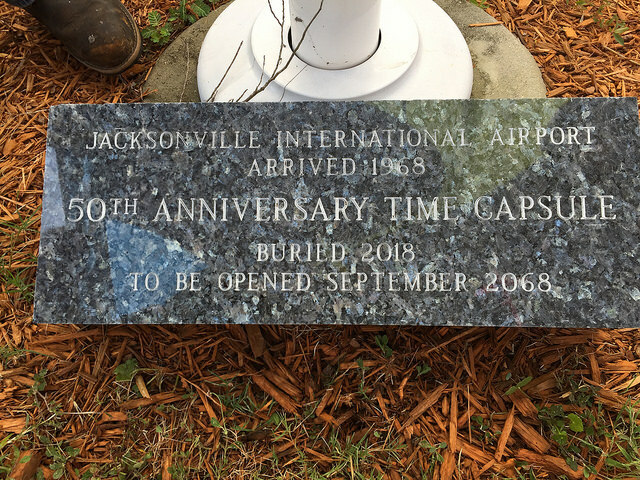 The idea to hold this ceremonial time capsule burial stemmed from a recent discovery of Jacksonville aviation related archives – some dating back to the late 1940’s, when Imeson was the commercial service airport for Jacksonville. This archive also included items dating back to 1968, the year JAX first opened its doors. Looking back on those photos and documents was an eye-opening experience that made employees contemplate how much had changed in 50 years. In 1968, the average cost of a new home was $14,950. The average monthly rent was $130. The average monthly income was $7,850 and the cost for a gallon of gas was thirty-four cents. It was also the year that the Boeing 747 made its first flight. 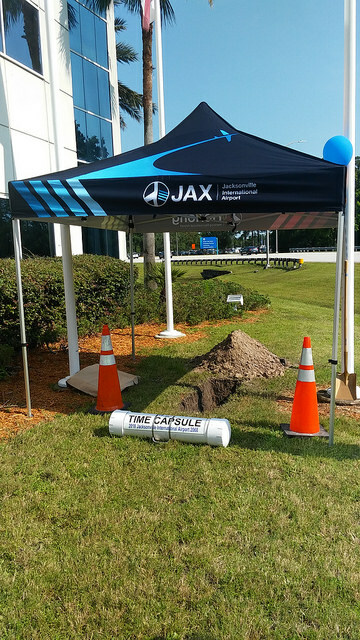 What will JAX look like in 50 years when our future leaders open the time capsule? Will Facebook, Twitter or Instagram exist in 2068? We wanted to give the people working at JAX 50 years from now a good idea of what the airport community looked like in 2018. A patch from TSA with a note to explain how they were formed after the events of September 11, 2001. A pin from Hertz Rental Car Company signifying their 100 year celebration, which is taking place this year. Many photos of current employees with their names, departments and the date. A list of the current Board of Directors at JAA and their photos. Flight magazines from airlines serving JAX. The current route map of all non-stop routes at JAX. June 20, 2018 Times Union. Richard Yeomans, Rochelle McVey and CEO, Steve Grossman prepare to bury the time capsule. We will continue to celebrate JAX’s 50th Anniversary with the opening of Phase II of the Aviation Gallery this Fall. Here’s to our next 50 years of Going Beyond, Daily!